Ralfy review 687: https://www.youtube.com/watch?v=VtCD4DhRWvo (91/100). "This is quite an old whisky but there's a youthfulness about that for the simple reason that one gets the stronger impression that the cask that this malt has been matured in is restrained, slightly underactive... It's a relatively simple malt, but it's delicious in its simplicity. ... 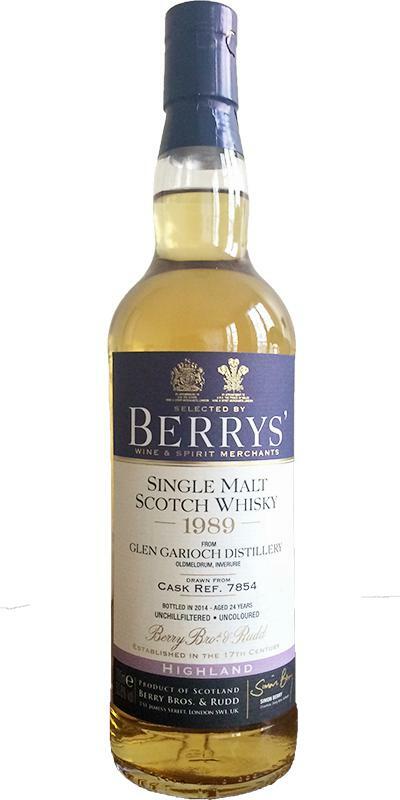 It's just a delicious, rewarding, unsafe, non-cosmetic single malt whisky..."
Tasted with Glen Gariochs 25yo 1990 SV cask 2752 (90 pts. ), 25yo 1990 DL XOP cask 10989 (88) and 25yo 1990 MacKillop's cask 8554 (89). Cooked potatoes, butter melting on them. Much more rounded and fatty than the other Gariochs on my table today (see comments). Minimal smoke, wet oak, wet cardboard, and with water some marmalade notes. Neat it's pretty raw, with some raking peat and drying oak. Acidic, not very fruity. Feels like the least mature whisky on the table. Water doesn't change it much, rather it just dilutes. Should be more full. It's good, but doesn't shine in the company. Tannic, drying finish with some sand and residual bourbon. Not very lasting or full. Too acidic, not firm enough. N: Savoury-sweet biscuit nose, some farm - quite some farm. F: Long finish with sweet bourbon cask leanings. Glen Garioch from the late '80s and start of the '90 hardly disappoints. Although this one is not as peated as some of its siblings, it's a very delicate whisky to enjoy with good company. Unexpectedly fragrant with estery smells. citric fruits, flowers, heather. Then, vanilla ice cream. After this intensive start, the whisky calms down and reveals a deeper earthy layer of mud, tobacco, walnut skin and a faint note of heather abundant peat. The taste is somehow sharp like a razor. Not hot, but very crisp on lemon zest, heather, and vanilla. On the other side, there is a dirty edge to be detected, as it was on the nose. Tobacco, salted licorice and other kind of roots, soft peat, and a distant whiff of tropical fruit. Far away, there is a hint of salted almonds. It leaves you with a long finish of heather, peat, licorice roots, tobacco, cigar box, and tropical fruit. Lovely.